Vico 4000 Pocket Luxury Divan Bed complete with 4000 individually pocketed springs.Contains Soft, Natural, Cotton, Silk and cashmere comfort layers.The fillings are also hypoallergenic, making the Vico 4000 perfect if you are an allergy sufferer. There are two comfort layers of gentle pocketed mini springs, Natural latex to assist healthy movement during sleep.This is a Non Turn Mattress just rotate occasionally. 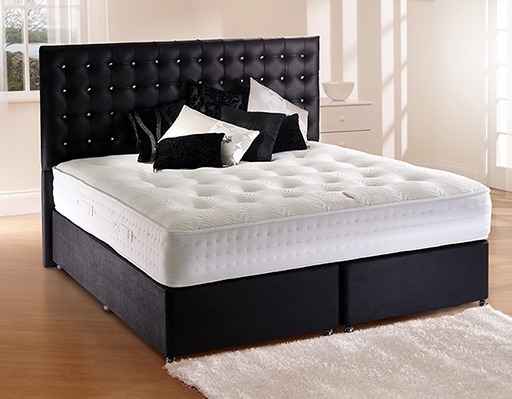 The Vico 4000 divan split base provides a firm foundation for the mattress and we offer a storage drawer and zip & link set option, with a range of luxury Headboards to matach in various fabric colours..